While Spain is well-known for its sunshine, but it also has excellent wintersports facilities, including Sierra Nevada, which is one of the highest ski resorts in Europe and has a selectaion of peaks over 3,000m. Sierra Nevada is Spain’s highest and most snow-sure ski resort. The ski area has the highest concentration of peaks over 3000m in the country making it perfect for early and late skiing. 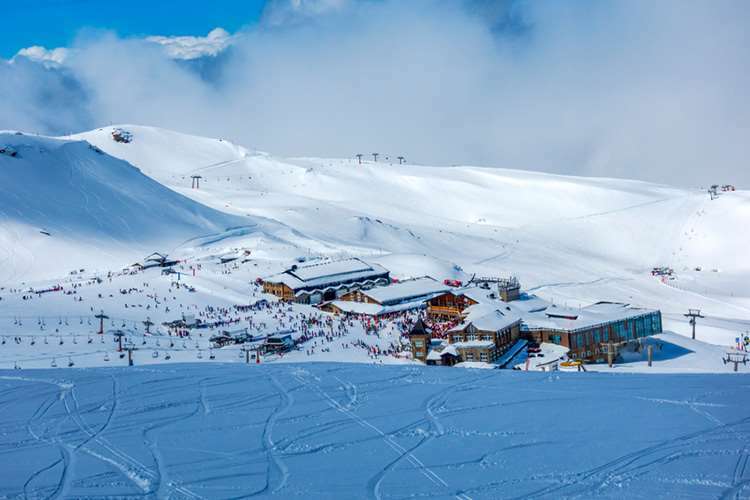 The resort base sits t 2100m with the top station at 3300m. 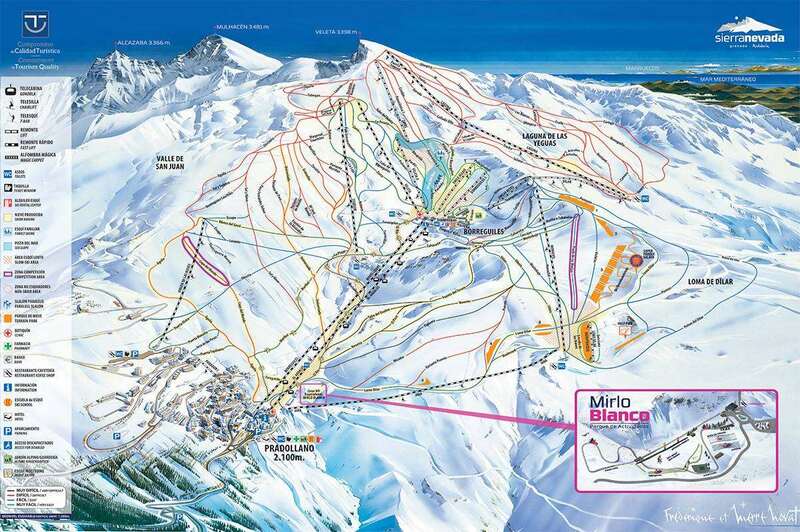 There are over 120 pistes of varying abilities that total 106 km. It is well-known for its outstanding amenities and incredible atmosphere, with runs above the tree line alongside narrow tracks for beginners. As well as this, there are some amazing off-piste options for experts. Situated close to the family-friendly resort of Granada, Sierra Nevada is right at the southern tip of the country and offers excellent views of the Atlas Mountains in Morocco. Much of the accommodation is based in older, traditional buildings that are set along a winding road leading up to a steep hillside. You can look forward to amazing selection of restaurants and bars and some fantastic accommodation to suit every type of budget. There is a fantastic array of runs available across the resort to suit all kinds of abilities, ranging from a beginners’ area to runs that require a lot of experience. Beginners visiting Sierra Nevada will be pleased with the well-groomed greens and blues on offer here but the resort is probably best suited for intermediates. The long reds (the longest is 6.5km and runs all the way from the summit of Veleta mountain at 3398m down to the village at 2,150m. Advanced skiers will find some challenges including a men’s downhill world cup run. As well as this, there are three ski schools in the region, which are perfect for those who want to learn the sport but do not know where to start. For those who are looking to improve existing skills, the Monachii area is recommended, while experts should consider taking on the Valeta II back down to Borreguiles. The ski season here runs from December to April and the conditions are magnificent, with well-groomed runs all over the region. Remember to bring your suntan lotion because this is officially the sunniest resort in Europe. And if you’re worried about the sun affecting the snow conditions then don’t- Sierra Nevada is nearly entirely covered by an advanced artificial snow-making system. Off the slopes there is plenty to do with saunas, a gym, snowmobiling, sleigh rides and plenty of shopping. The après ski is lively and typically Spanish- that means partying well into the early hours- and there are plenty of bars and clubs to party in. There is a wide selection of fantastic bars for visitors to choose from across Sierra Nevada, including amazing club nights such as Crescendo, Vaya and Chimenea. What’s more, there is a selection of snowsports for visitors to enjoy, including artistic skiing, trekking and adventure skiing, with plenty of fantastic equipment available for visitors to hire. Plus, if you visit during the week, you could find much smaller crowds than on the weekend. Located just 30 minutes’ drive away is the city of Granada, at the foot of the Sierra Nevada Mountains. The surrounding views stretch to the Mediterranean beaches in the south and the plains of the northeast. You can even combine a ski holiday in Sierra Nevada with the beach! 2 hours’ drive away from the resort is the Costa del Sol. Flights for Sierra Nevada arrive in at Malaga and then it’s about a 2 hour transfer to resort. I have skied all over the world and Sierra Nevada is one of my favorites. There is so much variety in the pistes to cater for beginners through to experts and the pistes are always perfectly groomed. The snow is also brilliant; every time I have been there, there has been several metres of snow topped with powder. The apres ski is great; there is a real mix of restaurants and clubs for when you are not on the slopes. I highly recommend Sierra Nevada to anyone wanting to go on a ski holiday of a life-time! The resort was excellent and there was good skiing and boarding for all levels. I highly recommend it.